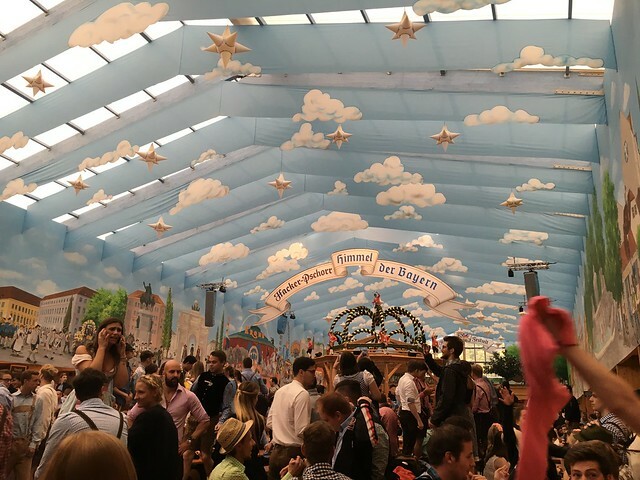 This year I finally tackled something on my 'Bucket List' - visit Oktoberfest in Munich. When Ben and I realized we would be in Europe during Oktoberfest, we reached out to one of my friends from high school, Theresa, who I met through our school's German exchange program. Her and her new husband Daniel (congrats!) joined us in celebrating Oktoberfest in the Hacker Pschorr tent. Fortunate for us, he was a seasoned Oktoberfest vet and got us where we needed to go. It went like this: everyone lines up at the various entry gates well before the fairgrounds open at 9am. Nearly everyone is dressed in the traditional lederhosen (men) or dirndl (women). Upon the gates opening, it's a mad dash. Everyone is running (mostly younger guys) to get to their beer tent of choice and dibs a table for their friends. We didn't run, but walked just briskly enough to secure four seats at a table (through careful negotiation by Theresa)! I feel like we got the last few seats, because we had to turn away dozens of requests to join us at our full table only seconds later. Like clockwork, a waitress came around with about 9 one-liter mugs of beer (they weigh about 5 lbs each). She carried these just in her two hands! Honestly one of the most impressive feats of strength I have seen. She slams the mugs down on the table and takes a tally of how many mugs we'd like this time. Everything is cash only, and the cash goes quickly! We were nervous about being able to drink so much beer at 9am, but come to find out, you just need to go back in time and channel the college tailgate mentality for a few hours. The atmosphere of the Hacker Pschorr tent was amazing. By design, it is a lovely day with blue skies - and impossible to tell how much time is passing. Groups of young guys were starting chants and singing while standing on the picnic table benches. Occasionally, someone would stand on the bench and hold their mug (full of beer) above their head. All eyes were now on them to finish their beer in one chug. If they succeed, the crowd erupts in cheers. If they fail, they have to pour the remaining beer they didn't drink over their head (while everyone boos)! High stakes, but it's all for the glory. The tables are inherently fun if you are a smaller group, since you will have to join up with strangers to fill your large table. I hadn't spoken German in about a year and felt rusty at first. But as it goes, when the beer flows, it's always easier to speak your second language! Maybe the true highlight of Oktoberfest for me was how impressed the Germans at my table were with my German. Thanks Hacker Pschorr! Ben's highlight was the entire thing, as "there can't be a low point of Oktoberfest!" However, one of things he found most hilarious was the seemingly random American songs Germans love to sing while drinking. For example: John Denver's "Take Me Home, Country Roads." Not sure how that got into the mix. Also, the song "Hey Baby (Won't You Be My Girl)" was a repeat hit - and beautifully sung while a woman stood up to chug her beer (successfully!). They really love that "whooo haaaa." Sometime after three (?) liters of beer each we wandered out of the tent, back into daylight. Upon leaving the tent, we waded our way past a crowd of around 100 people waiting to get into the Hacker Pschorr tent. You snooze you loose may be the takeaway from Oktoberfest. From there we wandered around through the carnival portion of the fairgrounds. Unfortunately, I have no photos of this portion of the day, because I have no photos after 11am! Daniel and I decided to go on a carnival ride and then we all walked around to see the expansive fairgrounds before leaving. I remember thinking at 7am that morning that it was going to be a long day, but it came and went before we knew it. Until next time, Oktoberfest. Below is an album of photos and videos from our weekend in Munich. The videos will only play if you watch on the original Flickr album (here).